IMAX® 3D фільм "Hidden Universe"
Вибачте! Ця сторінка ще не доступна на українській мові, тому натомість ми пропонуємо оригінальну версію. The original HUDF images were pioneering deep-field observations with the NASA/ESA Hubble Space Telescope published in 2004. They probed more deeply than ever before and revealed a menagerie of galaxies dating back to less than a billion years after the Big Bang. The area was subsequently observed many times by Hubble and other telescopes, resulting in the deepest view of the Universe to date . Now, despite the depth of the Hubble observations, MUSE has — among many other results — revealed 72 galaxies never seen before in this very tiny area of the sky. The survey unearthed 72 candidate galaxies known as Lyman-alpha emitters that shine only in Lyman-alpha light . Current understanding of star formation cannot fully explain these galaxies, which just seem to shine brightly in this one colour. Because MUSE disperses the light into its component colours these objects become apparent, but they remain invisible in deep direct images such as those from Hubble. Many other potential applications of this dataset are explored in the series of papers, and they include studying the role of faint galaxies during cosmic reionisation, measuring galaxy merger rates when the Universe was young, galactic winds, star formation as well as mapping the motions of stars in the early Universe. “Remarkably, these data were all taken without the use of MUSE’s recent Adaptive Optics Facility upgrade. The activation of the AOF after a decade of intensive work by ESO’s astronomers and engineers promises yet more revolutionary data in the future,” concludes Roland Bacon . 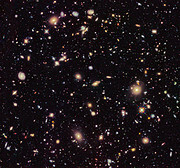 The Hubble Ultra Deep Field is one of the most extensively studied areas of space. To date, 13 instruments on eight telescopes, including the ESO-partnered ALMA (eso1633), have observed the field from X-ray to radio wavelengths. The negatively-charged electrons that orbit the positively-charged nucleus in an atom have quantised energy levels. That is, they can only exist in specific energy states, and they can only transition between them by gaining or losing precise amounts of energy. Lyman-alpha radiation is produced when electrons in hydrogen atoms drop from the second-lowest to the lowest energy level. The precise amount of energy lost is released as light with a particular wavelength in the ultraviolet part of the spectrum, which astronomers can detect with space telescopes or on Earth in the case of redshifted objects. For this data, at redshift of z ~ 3–6.6, the Lyman-alpha light is seen as visible or near-infrared light. The Adaptive Optics Facility with MUSE has already revealed previously unseen rings around the planetary nebula IC 4406 (eso1724). The teams are composed of Roland Bacon (CRAL - CNRS, Université Claude Bernard Lyon 1, ENS de Lyon, Université de Lyon, Lyon, France), Hanae Inami (CRAL - CNRS, Université Claude Bernard Lyon 1, ENS de Lyon, Université de Lyon, Lyon, France), Jarle Brinchmann (Leiden Observatory, Leiden, the Netherlands; Instituto de Astrofísica e Ciências do Espaço, Porto, Portugal), Michael Maseda (Leiden Observatory, Leiden, the Netherlands), Adrien Guerou (IRAP, CNRS, Université Toulouse III – Paul Sabatier, CNES, Université de Toulouse, France; ESO, Garching, Germany), A. B. Drake (CRAL - CNRS, Université Claude Bernard Lyon 1, ENS de Lyon, Université de Lyon, Lyon, France), H. Finley (IRAP, Université de Toulouse, Toulouse, France), F. Leclercq (University of Lyon, Lyon, France), E. Ventou (IRAP, CNRS, Université Toulouse III – Paul Sabatier, CNES Université de Toulouse, Toulouse, France), T. Hashimoto (University of Lyon, Lyon, France), Simon Conseil (CRAL - CNRS, Université Claude Bernard Lyon 1, ENS de Lyon Université de Lyon, Lyon, France), David Mary (Laboratoire Lagrange, CNRS, Observatoire de la Côte d’Azur, Université de Nice, Nice, France), Martin Shepherd (University of Lyon, Lyon, France), Mohammad Akhlaghi (CRAL - CNRS, Université Claude Bernard Lyon 1, ENS de Lyon Université de Lyon, Lyon, France), Peter M. Weilbacher (Leibniz-Institut für Astrophysik Postdam, Postdam, Germany), Laure Piqueras (CRAL - CNRS, Université Claude Bernard Lyon 1, ENS de Lyon Université de Lyon, Lyon, France), Lutz Wisotzki (Leibniz-Institut für Astrophysik Potsdam, Potsdam, Germany), David Lagattuta (CRAL - CNRS, Université Claude Bernard Lyon 1, ENS de Lyon Université de Lyon, Lyon, France), Benoit Epinat (IRAP, CNRS, Université Toulouse III – Paul Sabatier, CNES, Université de Toulouse, Toulouse, France; and LAM, CNRS / Aix Marseille Université, Marseille, France), Sebastiano Cantalupo (ETH Zurich, Zurich, Switzerland), Jean Baptiste Courbot (University of Lyon, Lyon, France; ICube, Université de Strasbourg, Strasbourg, France), Thierry Contini (IRAP, CNRS, Université Toulouse III – Paul Sabatier, CNES Université de Toulouse, Toulouse, France), Johan Richard (CRAL - CNRS, Université Claude Bernard Lyon 1, ENS de Lyon Université de Lyon, Lyon, France), Rychard Bouwens (Leiden Observatory, Leiden, the Netherlands), Nicolas Bouché (IRAP, CNRS, Université Toulouse III – Paul Sabatier, CNES Université de Toulouse, Toulouse, France), Wolfram Kollatschny (AIG, Universität Göttingen, Göttingen, Germany), Joop Schaye (Leiden Observatory, Leiden, the Netherlands), Raffaella Anna Marino (ETH Zurich, Zurich, Switzerland), Roser Pello (IRAP, CNRS, Université Toulouse III – Paul Sabatier, CNES Université de Toulouse, Toulouse, France), Bruno Guiderdoni (CRAL - CNRS, Université Claude Bernard Lyon 1, ENS de Lyon Université de Lyon, Lyon, France), Marcella Carollo (ETH Zurich, Zurich, Switzerland), S. Hamer (University of Lyon, Lyon, France), B. Clément (University of Lyon, Lyon, France), G. Desprez (University of Lyon, Lyon, France), L. Michel-Dansac (CRAL - CNRS, Université Claude Bernard Lyon 1, ENS de Lyon Université de Lyon, Lyon, France), M. Paalvast (Leiden Observatory, Leiden, the Netherlands), L. Tresse (CRAL - CNRS, Université Claude Bernard Lyon 1, ENS de Lyon Université de Lyon, Lyon, France), L. A. Boogaard (Leiden Observatory, Leiden, the Netherlands), J. Chevallard (Scientific Support Office, ESA/ESTEC, Noordwijk, the Netherlands) S. Charlot (Sorbonne University, Paris, France), J. Verhamme (University of Lyon, Lyon, France), Marijn Franx (Leiden Observatory, Leiden, the Netherlands), Kasper B. Schmidt (Leibniz-Institut für Astrophysik Potsdam, Potsdam, Germany), Anna Feltre (CRAL - CNRS, Université Claude Bernard Lyon 1, ENS de Lyon Université de Lyon, Lyon, France), Davor Krajnović (Leibniz-Institut für Astrophysik Potsdam, Potsdam, Germany), Eric Emsellem (ESO, Garching, Germany; University of Lyon, Lyon, France), Mark den Brok (ETH Zurich, Zurich, Switzerland), Santiago Erroz-Ferrer (ETH Zurich, Zurich, Switzerland), Peter Mitchell (CRAL - CNRS, Université Claude Bernard Lyon 1, ENS de Lyon Université de Lyon, Lyon, France), Thibault Garel (University of Lyon, Lyon, France), Jeremy Blaizot (CRAL - CNRS, Université Claude Bernard Lyon 1, ENS de Lyon Université de Lyon, Lyon, France), Edmund Christian Herenz (Department of Astronomy, Stockholm University, Stockholm, Sweden), D. Lam (Leiden University, Leiden, the Netherlands), M. Steinmetz (Leibniz-Institut für Astrophysik Potsdam, Potsdam, Germany) and J. Lewis (University of Lyon, Lyon, France). ESO is the foremost intergovernmental astronomy organisation in Europe and the world’s most productive ground-based astronomical observatory by far. It is supported by 16 countries: Austria, Belgium, Brazil, the Czech Republic, Denmark, France, Finland, Germany, Italy, the Netherlands, Poland, Portugal, Spain, Sweden, Switzerland and the United Kingdom, along with the host state of Chile and by Australia as a strategic partner. ESO carries out an ambitious programme focused on the design, construction and operation of powerful ground-based observing facilities enabling astronomers to make important scientific discoveries. ESO also plays a leading role in promoting and organising cooperation in astronomical research. ESO operates three unique world-class observing sites in Chile: La Silla, Paranal and Chajnantor. At Paranal, ESO operates the Very Large Telescope, the world’s most advanced visible-light astronomical observatory and two survey telescopes. VISTA works in the infrared and is the world’s largest survey telescope and the VLT Survey Telescope is the largest telescope designed to exclusively survey the skies in visible light. ESO is a major partner in ALMA, the largest astronomical project in existence. And on Cerro Armazones, close to Paranal, ESO is building the 39-metre Extremely Large Telescope, the ELT, which will become “the world’s biggest eye on the sky”. 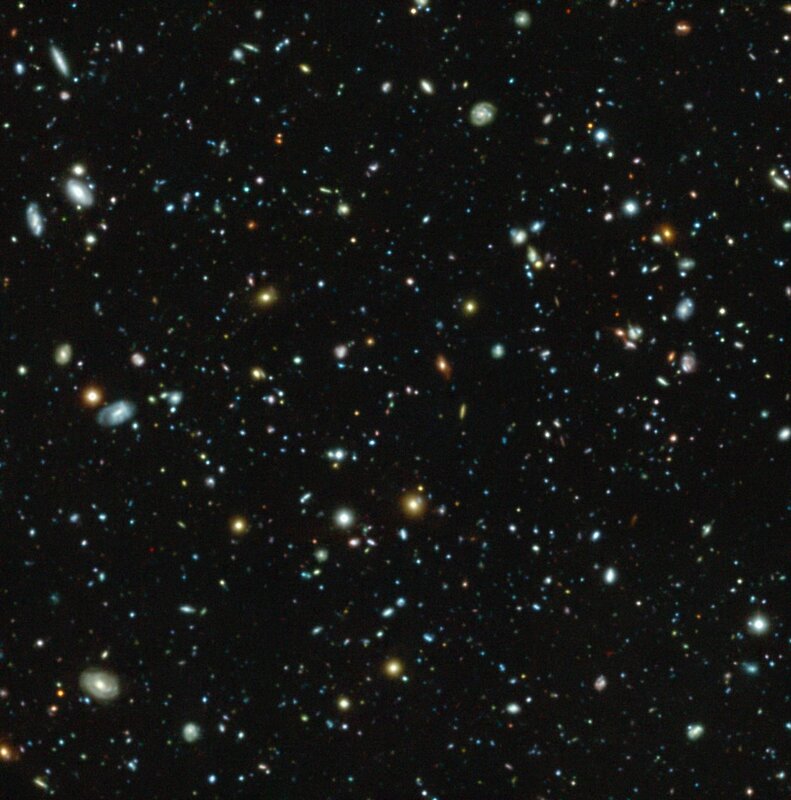 “The MUSE Hubble Ultra Deep Field Survey: I. Survey description, data reduction and source detection” by R. Bacon et al. 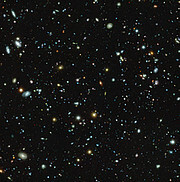 “The MUSE Hubble Ultra Deep Field Survey: II. Spectroscopic Redshift and Line Flux Catalog, and Comparisons to Color Selections of Galaxies at 3 < z < 7” by H. Inami et al. “The MUSE Hubble Ultra Deep Field Survey: III. Testing photometric redshifts to 30th magnitude” by J. Brinchmann et al. “The MUSE Hubble Ultra Deep Field Survey: IV. An Overview of C III] Emitters” by M. V. Maseda et al. “The MUSE Hubble Ultra Deep Field Survey: VI. The Faint-End of the Lyα Luminosity Function at 2.91 < z < 6.64 and Implications for Reionisation” by A. B. Drake et al. “The MUSE Hubble Ultra Deep Field Survey:VII. Fe II* Emission in Star-Forming Galaxies” by H. Finley et al. “The MUSE Hubble Ultra Deep Field Survey: VIII. Extended Lyman α haloes” by F. Leclercq et al. 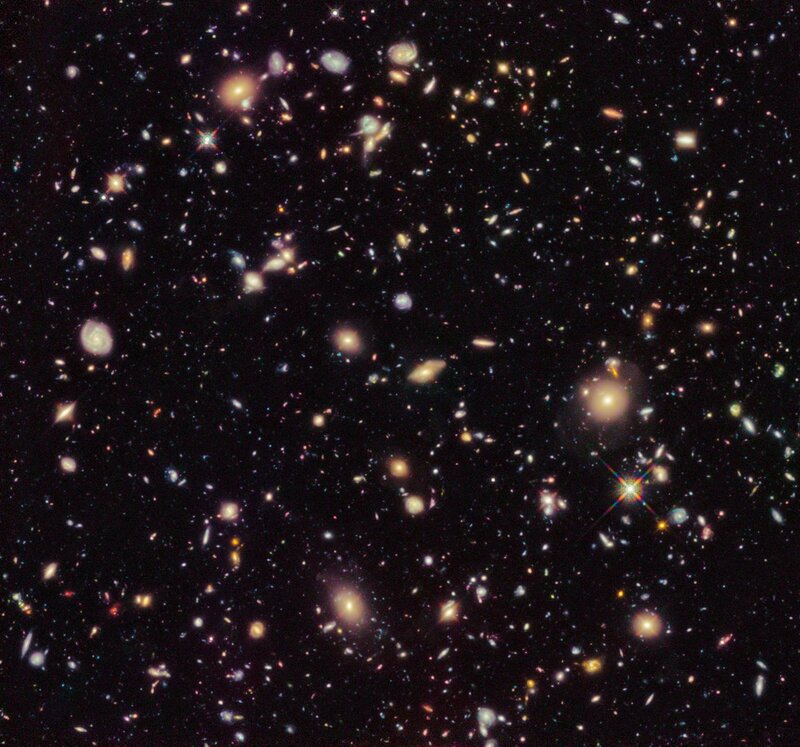 “The MUSE Hubble Ultra Deep Field Survey: IX. evolution of galaxy merger fraction up to z ≈ 6” by E. Ventou et al. “The MUSE Hubble Ultra Deep Field Survey: X. Lyα Equivalent Widths at 2.9 < z < 6.6” by T. Hashimoto et al.